Today's topic is Prom. At our school, prom was only for the Grade 12 students, and their dates. So you really only got to go once, unless you were asked to prom another year by someone in Grade 12. We had a small graduating class (60 in my year) so making sure you got a date was pretty important and around December/January, people started securing their dates. If you had a boyfriend/girlfriend, then it was assumed that was your date, but if not, then we just went with friends. Occasionally someone from a neighbouring town was a date, very exotic. No fancy "prom-postals" just a discussion at a party. My date was a friend of mine, Ryan. 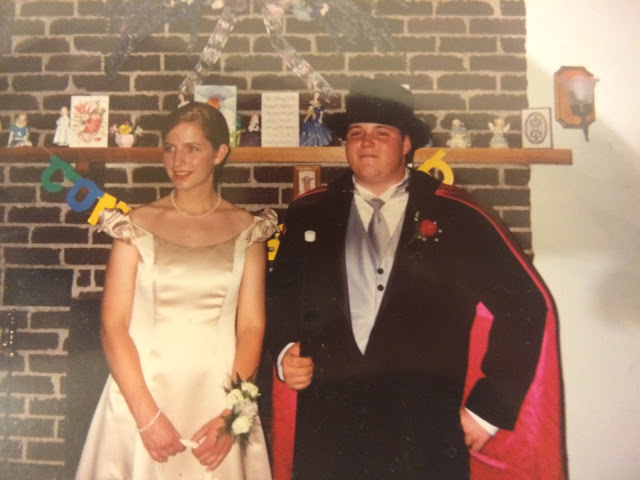 He chose the cane, top hat, and cape to go along with his tux. He was a big hit at the prom, very stylish. My dress was Alfred Sung and I got it in Halifax. I was able to wear it to a couple of formals in university and law school, so I got my money's worth. This is the only photo that I can find right now. I have a photo album but it is packed away somewhere. On the night of prom, Ryan and his parents and grandmother came over to our house to take some photos. Then we met some friends at a restaurant in town. The local antique car association then picked us up in their cars and we drove up to the school. No fancy hotels or banquet halls for us, our prom was in the school gym. As you can guess, in a small town prom is a big deal, so lots of people come out to take photos and it is like walking the red carpet. Our prom song was "I Will Remember You" by Sarah McLachlan, and I recall that our colours were navy blue, silver, and gold. After the prom, we all got changed, grabbed our drinks and went to the prom party. Our year, it was out in the country about 20 minutes from town. You could go to the prom party even if you didn't attend prom, so it was a big party. I don't remember how we all managed to get there and back home, but I know we were very careful to avoid drinking and driving. The police set up roadblocks to check for that, but they did look the other way on the underage drinking for the night. You and your date look great! Love that he got into the spirit with fun accessories! I'm dying at that cape! Oooh that's a good photo! That cape!